From the creators of Animatrix comes this visually-stunning new anime film based on a popular Japanese manga written by Taiyo Matsumoto. In Treasure Town, where the moon smiles and young boys can fly, life can be both gentle and brutal. This is never truer than for our heroes, Black and White, two street urchins who watch over the city, doing battle with an array of old-world Yakuza and alien assassins vying to rule the decaying metropolis. Tekkonkinkreet is a dynamic tale of brotherhood that addresses the faults of present day society, true love lost, and the kindness of the human heart. A brutal elegy for our changing times as well as a tour-de-force of visual artistry, Tekkonkinkreet is a deeply resonant story with a heart. The title Tekkonkinkreet is a play on the Japanese words for ‘concrete,' ‘iron,' and ‘muscle,' and it suggests the warring images of steel and concrete cities amassing against the powers of the imagination. Until now, at least in imports abroad, anime style has almost entirely been characterized by wide-eyed heroes, big robots, and uninspired plotting. 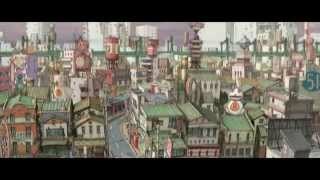 Tekkonkinkreet jettisons these stereotypes in favor of a more realistic, European ethos, successfully incorporating engaging child characters and a complex action plot into a poetic, engaging story.